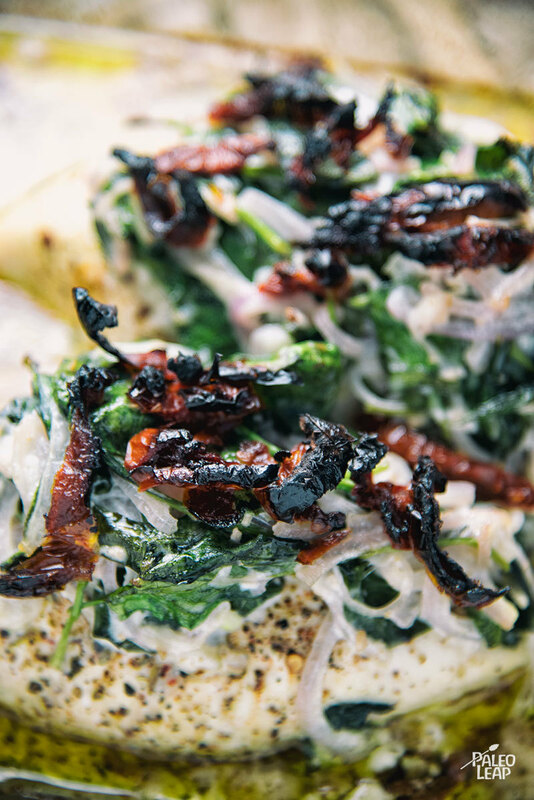 Creamed spinach is the kind of dish you need to try in order to really appreciate how awesome it is. While some may not find the name that appealing, creamed spinach is really flavorful and a healthy dose of greens, cooked in a way that makes them easy to add to other dishes or enjoy on their own. 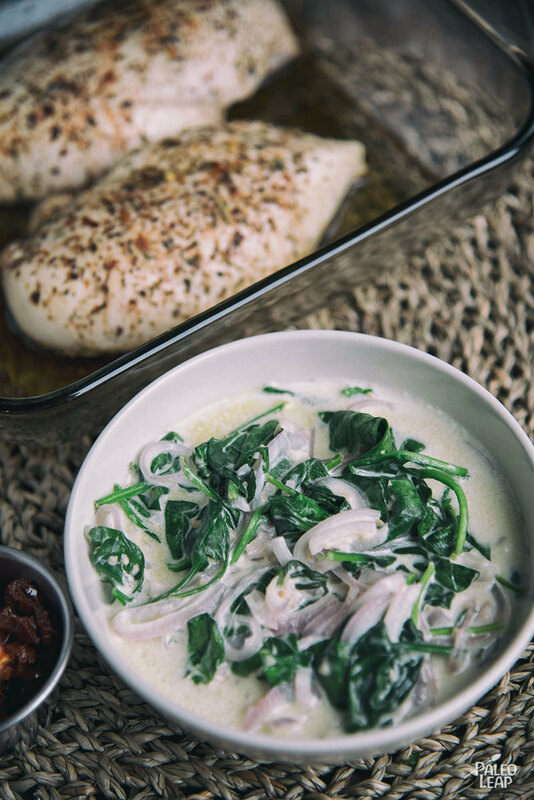 We love this combination with baked chicken – the baking process allows your chicken to be the focus of your meal, with a drier spinach cream than you might see in non-Paleo recipes. A few things to note as you’re prepping for this meal: It will require a bit of attention throughout the cooking process (since you’ll be making your creamed spinach as the chicken bakes). If you want to use this recipe on a busier night, try making the spinach sauce earlier in the day and letting refrigerate until you’re ready to bake the chicken. If you’ve never cooked with fresh spinach before, it might seem like way too much when you first add it to the pan. But fresh spinach quickly wilts, and you’ll end up with far less than you may have expected. You can easily double the spinach in this recipe if you choose! Although this recipe might have a nice vegetable base incorporated already, we think that for a complete dinner it might be best to add another simple side that works well with the flavors here. We like the idea of adding the Italian-style roasted vegetable side – even though the ingredients list is pretty long, the prep is super easy (and you can always omit some ingredients as needed). Another great option is the Tomato and Spinach salad – simple, and you can adjust to use the same ingredients you already have on hand from your main course. In a bowl, combine the olive oil, 2 garlic cloves, lemon juice and Italian seasoning. Season the chicken breast with salt and pepper to taste; melt some cooking fat in a skillet over high heat. Brown the chicken breast on both sides, 4 to 5 minutes per side. Place the chicken on a baking dish and pour the olive oil mixture over the chicken; place in the oven and bake 10 to 12 minutes. Melt some more cooking fat in the same skillet over medium heat and add 5 minced garlic cloves and the onion. Cook until soft and fragrant (3 to 4 minutes). Add in the spinach and cook until wilted, about 2 to 3 minutes, and pour in the coconut milk. Bring to a light boil and simmer 4 to 5 minutes; season with salt and pepper to taste and set aside. Pour the spinach mixture over the chicken, top with sun-dried tomatoes, and place back in the oven. Bake the chicken another 12 to 15 minutes or until chicken is cooked through.